Guinea Bissau - Planet Aid, Inc. Working with Ajuda de Desenvolvimento de Povo para Povo (ADPP-Guinea Bissau), Planet Aid supported vocational schools, teacher training, Farmers' Clubs, and Child Aid projects in Guinea Bissau through 2015. ADPP-Guinea Bissau began its work in the country in the early 1980s and has benefited more than 200,000 people in that time. ADPP-Guinea Bissau established a vocational school in 1997 to train youth in academic and technical skills. The subjects offered include solar energy, electricity, commerce and administration, agriculture civil engineering, and rural irrigation and plumbing. These topics provided graduates with skills that were in demand by the local market, and enabled them to start their own business. Academic subjects included math, Portuguese, geography, biology, and physics. Students also completed courses in HIV/AIDS awareness, and participate in community campaigns to educate communities about the epidemic as well as about malaria and tuberculosis. Since its opening, the vocational school has graduated more than 800 young men and women. More than than 50 percent have been placed in jobs with local employers. Read more about Vocational Schools. The teacher-training college in the town of Cacheu trained future educators through a partnership with Planet Aid's sister organization Humana People to People, and the European Union Delegation in Guinea Bissau. In 2015, 43 new students began the three-year teacher training program and another 36 students entered into their second year. Thirty-six students entered into their third and final year in the program, having completed the full-time training in 17 schools across the Cacheu region. 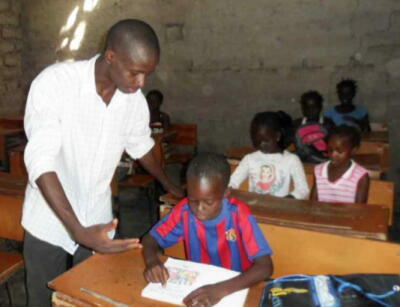 Though this project is no longer supported by Planet Aid, it does continue to train teachers. Read more about teacher training. The teacher-training college in Cacheu led to the integration of the Child Aid project into 55 primary schools around the college to further improve the quality of education in the region. A number of community activities were also implemented through the program, including agricultural production, tree planting, sanitation initiatives, and communal cultural events. In 2015, the last year Planet Aid supported the college, the Child Aid program established 45 new preschools, reaching over 2,200 students. It also improved health and sanitation in the region by building 28 new latrines and 31 wells. Read more about Child Aid. In November 2008 ADPP-Guinea Bissau began the Farmers’ Club project in the Oio region, organizing 12 clubs of approximately 50 farmers each. Through the club venue, farmers are encouraged to share information about diversifying crops and devising ways to operate more efficiently and economically. Clubs were provided with training in modern but simple sustainable agricultural practices and are linked to local markets. In Guinea Bissau, more than 3,000 farmers and their families have taken part in these clubs. Read more about Farmers' Clubs.